Registered Medical Assistants (RMA), the American Medical Technologists (AMT) and Northeast Technical Institute (NTI) are recognizing National Medical Assistants Recognition Week this week and during the month of October. This month recognizes the contributions of the medical assisting students and personnel whose efforts help give our nation the best possible health care. The health of all Americans depends upon educated minds and trained hands; and the practice of modern medicine at the exacting standards we now enjoy would be impossible without the clinical and administrative duties performed daily in the physician’s office, clinic, laboratory and hospitals. These multi-skilled professionals help create a professional and comforting atmosphere for patients by offering them guidance and support, and through this dedication the medical assistants of the United States have made a vital contribution to the quality of health care. 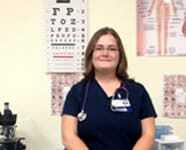 NTI’s Bangor Campus congratulates a recent Medical Assistant graduate, Aubrey Wiggins, RMA, on her nomination to be recognized nationally as a Medical Assistant. “Aubrey demonstrated an infectiously positive attitude and the ability to develop a comforting rapport with her fellow classmates.” Wendell Scott, CCMA AHI. NTI understands the importance of practical education that will prepare students for a new career. Students at NTI come from a variety of backgrounds and the school’s approach is to give all students the tools they need to be career ready including intensive hands-on training. The externship program provides students with real-world “on-the-Job” training which can often lead to employment.